The betrayals and breakdown of the Copenhagen summit strengthened the climate justice movement because it demonstrated so clearly that salvation was not coming from above. We came to Paris with our eyes wide open, looking to each other instead of the summit, bracing ourselves for a weak deal and planning for the future. It’s not what we marched for. As New Internationalist explains, it fails on every front: on emissions reduction, on reparations for the global South, on the rights indigenous communities and working people the world over. Under this deal, we’re looking at 3-4 degrees of warming, and that is catastrophic. Avaaz was a driving force behind this year’s massive climate marches, but this movement’s centre-ground is riven with contradictions. WWF partners with Coca-Cola to ‘save the polar bears’ in the Arctic while it steals drinking water from India’s poor and hires thugs to murder union activists in Latin America. And along with Avaaz, they invite mega-corporations like Unilever, a leading food monopoly with an atrocious labour and environmental record, to back its ‘People’s’ Climate March. It’s worth noting the mobilisation was supported by the Climate Group – a green-washing front for big bad wolves like BP, Dow Chemicals, Goldman Sachs and J.P. Morgan – and Avaaz’s founder used to work for the Gates and Rockefeller Foundations. That helps explain why $220,000 went on glossy posters inviting Wall Street bankers to join the demo. It’s a sound investment if you believe the 1 per cent are the real agents of change. That’s not the attitude you’d expect from a ‘campaigning community’ for ‘people-powered politics,’ but it would also explain why they didn’t want the Global South bloc, Wretched of the Earth, leading the climate march on 29th November. Black people shouting about economic colonialism are not who bankers want to see leading a march of thousands. But the agreement fails even by Avaaz’s own standards. They campaigned for a concrete and dated commitment to 100 per cent clean energy. What we got was a heavily padded commitment to ‘net-zero’ with exactly the kind of policies that have failed us so far. And it’s not even binding. In one sense, this is deeply ironic and insulting. Avaaz may take pride in its marches and petitions, but it hardly compares to decades of mass-resistance in the face of brutal state repression. Thousands of black men and women were brutalised and killed in their struggle against racist oppression and segregation. And it is indigenous and black communities that the Paris Accord failed more than anyone. However there is an unintended sense in which the analogy is entirely appropriate. In 1955 the African National Congress’ (ANC) sent 50,000 volunteers into the townships and rural villages to collect ‘freedom demands’ from the people. The result was a powerful and radical call not just for the end of segregation – the most institutionalised manifestation of white exploitation and oppression – but for true, economic equality. Black South Africans didn’t rise up and risk everything because wanted to share busses with white people; they wanted social justice. Despite Avaaz’s assertion that “the fall of Apartheid led South Africa to the single most bold and progressive constitution in the world,” it was in truth a huge step back from the Freedom Charter, which had been the political heart of South African resistance. It doesn’t take a genius to work out which aspects he was talking about: the Freedom Charter’s calls for free education and decent housing; living wages and shorter work hours; land for the landless and the restoration of the national wealth to the people. All the things apartheid kept cordoned off from the black majority; the things the climate crisis gives us a ‘once in a century’ chance achieve. Since the ANC took power, the number of black South Africans living on $1 per day has doubled and average life expectancy has dropped by thirteen years. Homelessness has risen and by 2004 over a million people had been evicted from their farms. Protesting workers are murdered by police and small-scale farmers are on the frontlines fighting pollution and industrial agriculture. The gap between rich and poor greater now than under the apartheid regime; in fact along with the Seychelles, South Africa is the most unequal country in the world. So, modern South Africa is about as progressive as COP21, which LDC Watch eloquently describes as ‘a nail in the coffin for justice for the least developed countries’. And the struggle against climate apartheid is only beginning. What The Freedom Charter once called for are all the things the climate justice movement wants for the world today. And they are the very principles COP21 has turned its back on. Second, this is so much more than an environmental campaign or a section of the labour force organizing for its interests: it’s an independence movement, in the truest sense of the word. I was reminded of Mandela’s Freedom Charter. One of its most significant and indeed radical demands was that ‘land be given to all the landless people’. Really, it was the moral and economic heart of the anti-apartheid movement; one that was ultimately sacrificed by the African National Congress in exchange for a far less tangible and ultimately limited form of freedom for black South Africans. In exchange for national independence they sacrificed economic autonomy: a contradiction in terms, as South Africa – with the rest of the global South – would come to learn. But in this movement, the reclamation of the land takes on such enormous significance, and the environmental case for it is made with such clarity, it is hard to imagine it being sacrificed a second time. The climate justice movement offers a wealth of solutions that never get a fair hearing. Every cornerstone of a just, sustainable future, from community-owned energy in the sky to organic agriculture in the earth, is consistently swept aside as utopian thinking. This is particularly irritating given the spectrum of fantastical and occasionally genocidal schemes that do manage to find traction among power-hungry politicians, profiteering corporations and some truly eccentric scientists. To remind climate justice activists the world over that we are the ones with our feet on the ground, let’s take a look back at some of the worst. Carbon pricing and trading emerged from the failure of the Kyoto Protocol to establish a proper cap on emissions in 1992. It has been the flagship free-market climate policy ever since, taxing emissions and issuing tradable pollution permits to businesses and institutions. Often, low-carbon institutions like hospitals and universities are obliged to buy extra credits while the corporations cash in. Big Polluters have made a killing by speculating, cutting corners and generally defrauding the system, sometimes deliberately producing more emissions just so they can get paid to dispose of them. Like all free-market fixes, it’s extremely lucrative; between 2005 and 2010 the global carbon market turned a $500 billion profit. The Intergovernmental Panel on Climate Change estimates carbon taxes are five times too low to discourage the Big Polluters (which, given their more than $5 trillion of annual subsidies, they can afford.) But they are high enough to put a heavy burden on working people, to whom energy companies pass on extra costs. More than 1 in 10 Europeans are blighted by energy poverty, which is forecast to kill 40,000 people this winter in Britain alone. This also contributes to creating the apparent conflict of interest between the planet and the poor. Lastly, the scheme has completely failed to halt rising emissions. That the EU’s own watchdog admits the scheme is ‘almost never enforced’ gives some indication of how seriously our leaders really take the climate threat, whatever their rhetoric. No wonder, then, that instead of falling, emissions have been rising at their fastest rate in 30 years. Really bad idea. Whatever the problem, selling it off is the only solution the market ever has to offer. And since the crash of 2008, politicians have been selling off public services faster than ever. The resulting devastation of our education, healthcare and welfare systems hasn’t put them off – now they want to apply the austerity model to the fight against climate change by privatizing the planet itself. Nature is reduced to ‘natural capital’; our forests, rivers and fields become ‘green infrastructure’. And the results are utter nonsense. The UK’s Natural Capital Committee has established a price for the aesthetic value of Britain’s lakes and rivers (at about $1 billion.) But you can’t quantify beauty, measure happiness or put a price on what is priceless. The conviction that we need to is rooted in the belief that people only value something if you slap a price tag on it. That might be true for the CEOs lining up to buy our planet but the research suggests most people deserve a bit more credit. Unfortunately, some sections of the environmental movement have adopted this language of ‘natural capital’. As Guardian columnist George Monbiot and others have argued, in committing themselves to an ultimately doomed attempt to make big business care about the earth, these ‘mainstream environmentalists’ have destroyed their own moral authority and in doing so, undermined their ability to mobilize the grassroots. Really bad idea. Biofuels have long been pushed by big business as a magical alternative to oil and gas – even though they are inefficient, expensive and enormously destructive. In fact, the production of biofuels often emits more greenhouse gases than conventional fuels, not to mention the fact it’s become a leading driver of deforestation, reducing vast tracts of ancient, irreplaceable forest to dead land. It also gobbles up enormous amounts of water, which is exactly what we don’t want as droughts and pollution diminish this most precious resource, on which all life depends. Biofuel production has also driven up the price of grain, threatening hunger, instability and conflict. And this is just a small part of the unspeakable havoc wreaked on food security by the globalization of industrial agriculture, which has exhausted our once-abundant planet. For example, despite controlling three-quarters of all farmland and enjoying massive government subsidies, industrial farming produces only 30 per cent of our food. In just 40 years, its senseless intensity (almost half the food produced is wasted,) has destroyed a third of the world’s arable land while somehow still managing to leave 800 million people hungry. Genetically Modified Organisms (GMOs) have been trumpeted as another ‘big fix’ for hunger and climate change, despite widespread health concerns and the fact they fail the most elementary standard for sustainability: they are non-renewable. Corporations in the climate negotiations are pushing heat-resistant GMOs and ‘smart-fertilisers’. From an environmental perspective, these methods not only worsen the climate crisis, being both water and fossil-fuel intensive, but heighten vulnerability. Most GMOs are more susceptible to drought, floods and disease and so require intensive mechanical and chemical treatment to survive – which means big bucks for the agribusiness corporations that sell them. It also means peasant farmers are priced off their lands or buried beneath mountains of debt, contributing to almost 300,000 farmer suicides in India over the past decade in what has become known as the ‘GM genocide’. Really bad idea. Like nuclear power, the science of ‘weather management’ started off in weapons development at the heart of the military-industrial complex. But since the breakdown of the COP15 negotiations in 2009, Solar Radiation Management (SRM) has resurfaced as a ‘last line of defence’ for the planet; a substitute for (and for some, preferable to) regulating emissions. From filling the stratosphere with sulphate to erecting giant mirror-roofs across the earth to reflect the sun’s rays, SRM proposals range from surreal to plain stupid. Injecting sulphates into the atmosphere, for example, mimics the sun-blocking effects of volcanic eruptions: widely considered the most life threatening of all natural disasters due to their long-lasting and unpredictable disruption of natural weather patterns. Putting aside the question of who’d be in charge of the thermostat, we really have no idea what the side-effects might be and no way to test, since the only appropriate laboratory is the planet we’re living on. Most SRM proposals are ‘lock-in’ strategies, meaning we start pumping out one kind of pollution to deal with another kind of pollution with no idea how to stop without frying everything to a crisp. And even optimistic projections predict SRM would fry swathes of the global South to a crisp anyway, disrupting the monsoon and ‘completely drying out’ the Sahel region of Africa, threatening 4.1 billion people. Really bad – and slightly genocidal – idea. There is no business bigger than the fossil fuel business. This is an industry with friends in all the high places, subsidized to the tune of $10 million every minute of every day and making annual profits equivalent to the GDP of France. They have 20 trillion reasons to extract every last bit of oil, coal and gas: all of them dollars. They are not our allies. As Friends of the Earth’s Asad Rehman put it here in Paris: ‘Putting corporates in the driving seat for climate negotiations is like putting Dracula in a blood bank.’ Yet that’s exactly where they are. Corporate Accountability International notes in its report, Fuelling the Fire: the Big Polluters Bankrolling Cop 21 that these corporations have a long history of political interference with environmental policy making. On one hand, they routinely engage in sophisticated campaigns of misinformation about climate change; on the other, clean up their image by funding COPs and joining climate marches. Pierre-Henry Guignard, Secretary-General of the UN summit, promised this year to build ‘a very business-friendly COP.’ This is a contradiction in terms. Pretending it’s not, hides the root of the problem from the public and leads us down a twenty-first dead end. It is the mother of all bad ideas. Within the market system, all proposals are viewed through the lens of commercial viability. We see this battle between cost efficiency and actual efficiency being played everywhere in the market’s warped attempts to tackle global warming. It promotes the proposals which turn a profit over those that might actually help us, every single time. To quote Monbiot: ‘What we are talking about is giving the natural world to the City of London, the financial centre, to look after. What could possibly go wrong? Here we have a sector whose wealth is built on the creation of debt. That’s how it works, on stacking up future liabilities. Shafting the future in order to serve the present: that is the model.’ It’s the model that got us into this mess and it’s not going to get us out of it. It’s fantastical, fictitious, pie-in-the-sky fundamentalism, and our job is to expose it as such, not adopt its language and values as our own. So we need to reclaim realism, assert our own values as boldly as our adversaries, and mobilize around the principle that life – all life – is more precious than profit. The big polluters will never want to pay; so it’s time for them to get out of our way. Crete is a remarkable island of outstanding natural beauty and vibrant traditional culture. I arrived there at the end of the tourist season, as the tavernas and hotels were preparing for hibernation. 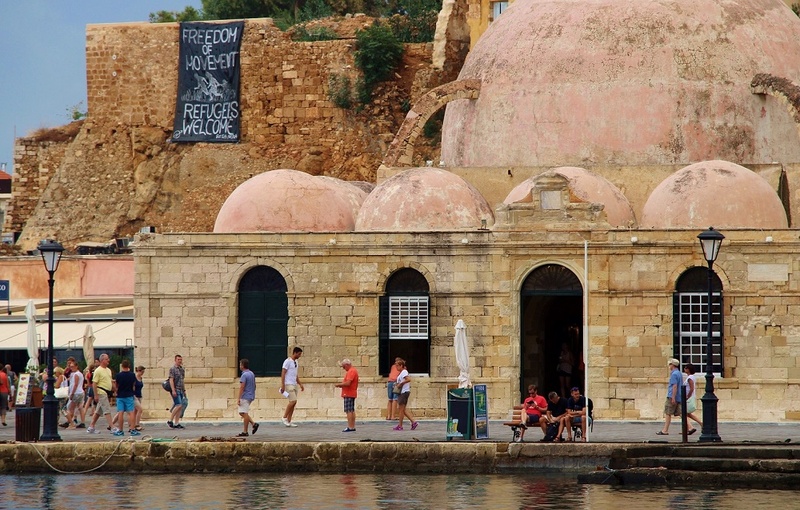 In Chania, a beautiful coastal town drenched in romantic colonial charm, a great black banner reading “Refugees Welcome” hung from the old Venetian castle overlooking the harbour. But none could be seen amidst the tapestry of designer shops and coffee bars. Still, their ghosts seemed to fill the streets and a sense of foreboding quickly entered most conversations on the topic. When I told people my next stop was the island of Lesvos, eyebrows typically rose above hairlines. Many business owners said they feared tourists getting the “wrong impression” about Greece. When assured that I thought highly of their country and knew what to expect on the island, eyebrows fell off the backs of heads. Then, why would I go? Don’t I know how dangerous it is, “a white woman alone at the camps”? 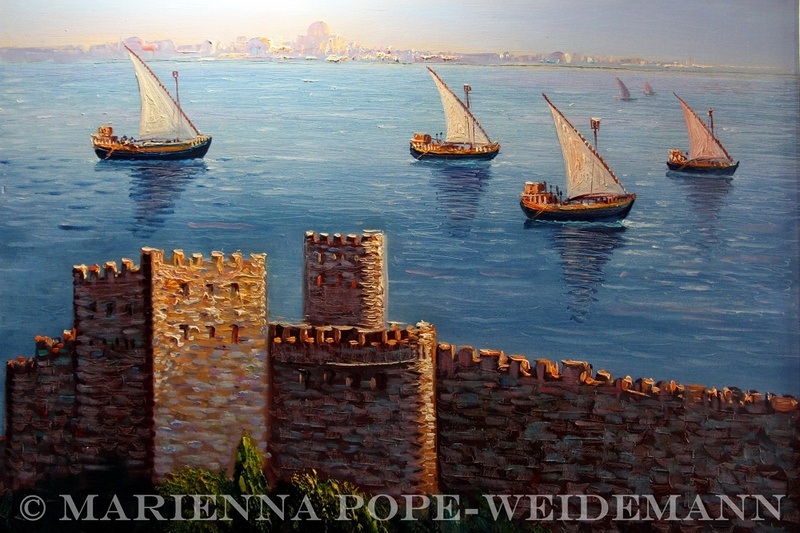 One hotel manager described the refugees in medieval terms, as “Muslim invaders.” I reminded him that they were not soldiers but civilians, many of them women and children. He was dismissive. “They are single men looking for an easy life. They should stay and fight for their country, like we did,” he replied, referring to the Greek civil war of 1946-49. “They have no respect for our culture,” one hotel owner complained, repeating the now widespread myth about refugees defecating in Greek churches (which turned out to be a lie cooked up by supporters of the fascist Golden Dawn party on Twitter). Since the financial crash, many progressives have looked with envy at the spirit of resistance that has fueled Greece’s mass strikes and civil disobedience and swept Syriza into power. But those days may be coming to an end. The day I arrived in Crete there was (another) general election; Tsipras was running for a renewed mandate after bowing to the austerity memorandum that a clear majority of Greeks had bravely voted against in his referendum. It brought to mind Emma Go ldman’s famous adage that if voting changed anything, it would be illegal. Tsipras held onto power, but voter turnout plummeted to 56.65%, the lowest ever recorded in Greece since the restoration of democracy in 1974, and Golden Dawn received 100,000 votes. In the islands of Kos and Lesvos, which have been overwhelmed by refugee numbers, support for the neo-Nazi party has doubled. Many progressive Greeks are suffering a crisis of faith. Tsipras’ pyrrhic victory has cost him the confidence of a disillusioned country. Basilis, a tall, eloquent man in his early forties who would seem more at home lecturing at a university than working at a taverna, told me that, though passionate, he felt too old and too tired to continue the political struggle. Instead, he would go back to his family farm for the harvest. 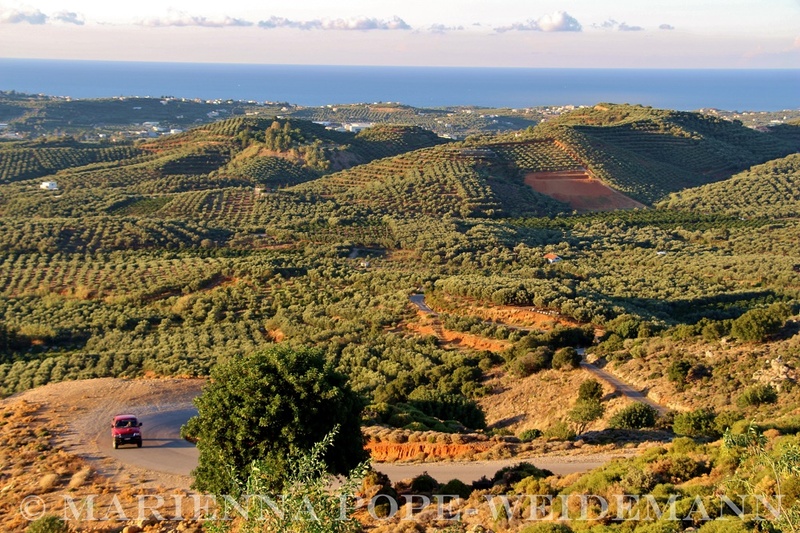 The island’s iconic rolling orchards of olives and oranges are part of the fabric of life here. December’s olive harvest is an annual event of immense cultural (if not economic) significance to Crete, where small-scale organic agriculture is still an intrinsic part of community life. Young and old, rich and poor, in the orchards or just in the garden, most Cretans still maintain a close connection to the land. And they work without pesticides, using Indigenous methods like limewash to protect their crops. When I told Basilis how much we pay for organic tomatoes in the UK, I had to Google it before he’d believe me. This culture—and the reduced stress levels, high life-expectancy, and sumptuous food that come with it—is a big draw for tourists, oblivious to the fact their banks and governments at home are threatening it with extinction. During a visit to Crete’s blue lagoon, one local had explained to me that areas of outstanding natural beauty in Greece are marked as “zones protected from the EU.” But the vast bulk of Gre ece’s agricultural land has no such defence. Under the terms of the austerity memorandum signed by Tsipras, taxes on Greek farms will double, forcing many organic family farms out of business. In this economic climate, only big agribusiness can thrive by compromising the environment, food quality, and wages. 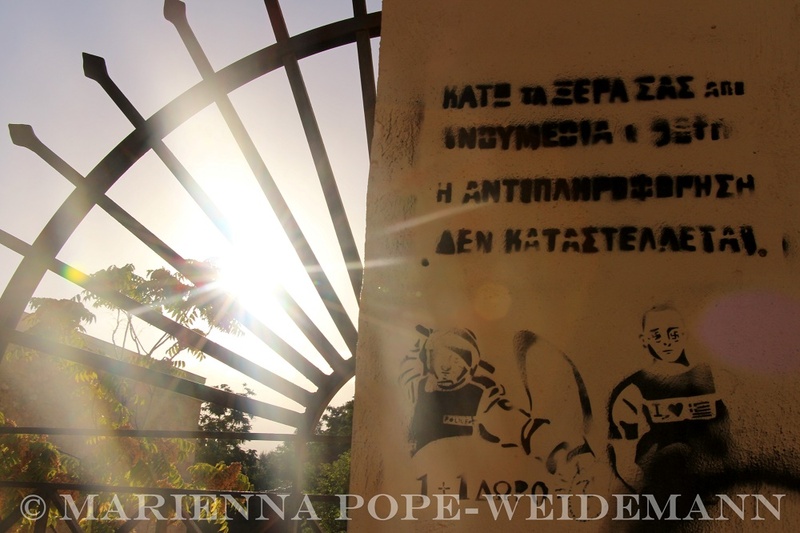 What I witnessed in Crete—the growing xenophobia and corporate enclosure of the farmlands, the social breakdown and erosion of hope—seemed particularly poignant given the island’s venerable history. Four thousand years ago, it was from this island that the ancient Minoans built an astonishingly advanced civilization, with its pioneering literature, theatre, and seafaring, and established a society marked by remarkable sexual and social equality. Where property was held in common, today selling off land and services to private interests is, for many, the only way to survive. Many Greeks have opened their hearts and homes to the refugees. But for others, the economic crisis makes exclusion not only justifiable, but essential. “We must stop building camps to encourage them, they need to go,” one small business owner told me in Crete. “We have no resources to care for our own people.” With war veterans eating out of rubbish bins in Athens and the suicide rate soaring, that much is true. In a way, it’s also ironic. As youth unemployment hovers around 50 per cent, Greece is already producing its own “economic migrants”: educated young men and women whose talents the Greek economy can’t use, and who now dream of doing meaningful work for a decent wage abroad. 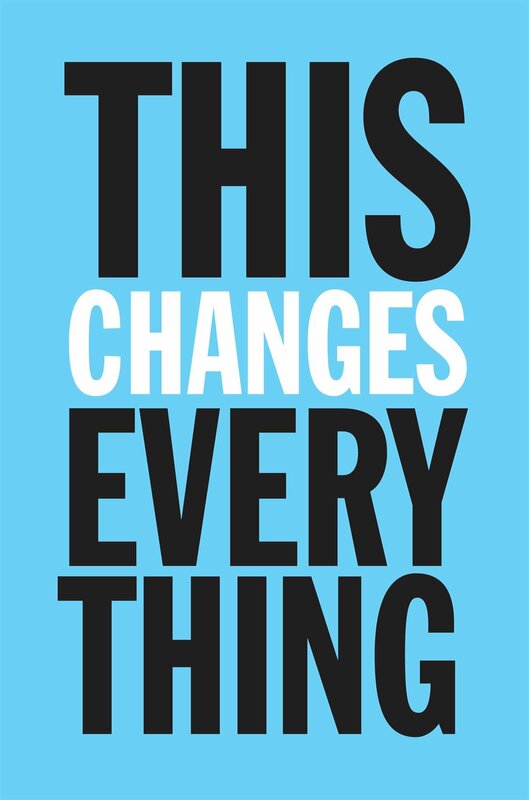 On Saturday 28 March a mass participatory gathering on climate change and the alternatives will be addressed by Naomi Klein, Russell Brand and many others. Dan Swain spoke to two of the organisers, Neil Faulkner and Marienna Pope-Weidemann. Dan: Can you explain what the plans are for This Changes Everything, what you hope for the event and what you hope will come out of it? Marienna: This Changes Everything is mass participatory gathering that will bring a thousand people together with activists and campaigners to debate some of the biggest questions of our generation. It’s about joining the dots between different elements of the crisis – war, poverty and climate change – joining the dots for a common solution, and finding ways to support each other in the struggle to make it possible. Our organising group is pretty diverse, ranging from black bloc protesters to Green Party canvassers. That comes with challenges, but it’s all about building something broad and vibrant, more of a network-community than a ‘new coalition’. And what binds us together is an understanding of the need for system change – and an appreciation that to achieve it, we also need to voice a positive vision of the alternative. The byline we chose, ‘Democracy, Equality, Survival’ sums up the elements we want to see brought together: the system’s become so rabidly corrupt, so exploitative, so pathological, that those things can’t be won in isolation anymore. We achieve them together, or not at all. Neil: Perhaps, in a wider sense, the concept represents a throwback to the looser, more bottom-up ways of organising represented by late 1960s movements like the American SDS, the 22 March Movement in Paris, the German SDS, and People’s Democracy in the North of Ireland. Another way of talking about it is to say that it is not quite like anything that currently exists – not a ‘united front’, not a single-issue campaign, not a party, certainly not a sect. Not least, it is a reaction to the plainly dysfunctional forms of ‘democratic centralism’ that characterise so much of the far left. Speaking personally, I think we need mass revolutionary organisation in Britain. I cannot see any way out of the crisis – a compound crisis with ecological, economic, imperial/military, social, and political/democratic dimensions – which does not involve ending the rule of capital and establishing mass participatory democracy and rational control over the world’s resources in line with human need and planetary sustainability. So we need to build mass revolutionary organisation – mass organisation that aims explicitly for total system change to achieve social justice and climate justice. I see This Changes Everything as a stepping-stone towards that. Dan: How do you see the relationship between This Changes Everything and the existing climate and environmental campaigns and organisations, from big NGOs to local anti-fracking campaigns? Marienna: The climate movement has become very polarised in recent years, and particularly since the disaster of the 2009 Copenhagen Summit. Since the beginning I’ve thought of This Changes Everything as a response to a ‘red-green disconnect’ that’s emerged, mostly as a product of the dismal strategy adopted by more conservative elements of the climate movement. I see it as a priority for This Changes Everything to call some of the big green groups out on their silence because to the extent they have influence, they’re driving us down a dead end, because this system has got to go. Plus, beating the drum of ‘individual responsibility’ – blaming all our little actions and inactions equally instead of popularising the systemic critique and putting blame where it belongs is no way to build a movement. Not being clear about the problem makes it impossible to be clear about the solution. It breeds depression, political paralysis and resistance to change. That said, the radical wing of the climate movement is a rising tide. From highly politicised indigenous movements on the front lines in the Global South, to the fantastic work being done by grassroots, anti-fracking and fuel poverty campaigns on the front lines here in the UK. A lot of great work is being done by people who understand that climate justice and social justice are now co-dependent, symbiotic. It’s not an alliance of distinct struggles to bulk up numbers: it’s one crisis, one movement, one vision. There is no radical Left manifesto that doesn’t have a solution to the climate crisis at its heart; and you cannot expect the environment to be treated with respect in a society where people are treated like trash. Neil: There are three great forces in the modern world: globalised corporate capital; the militarised states; and the mass of working people. The first two form a unified bloc and are highly centralised. In fact, they are more centralised than ever before in human history. There is a vast gap between where most people live out their lives and the great concentrations of economic and political power like that represented by, say, the half dozen oil companies that dominate the global industry, or the ‘troika’ of EU, ECB, and IMF, or tax-havens and mega-casinos like the City of London. We cannot fight the system effectively issue by issue, campaign by campaign, action by action. The system, and therefore the crisis, is an integrated whole. Power over the system is highly concentrated. We have to build united mass movements to confront that power if we are to have any chance of winning major victories. Dan: I notice that the Young Greens are listed as supporters, and obviously they have received a big boost recently. What’s your assessment of the Greens as a political force? Neil: The Greens have become the main electoral expression of what can be defined broadly as ‘anti-capitalist’ opinion in England. It is very good that people want to join and vote for an explicitly anti-neoliberal, anti-war, anti-climate change party. But it is not the solution to our problems. The fate of the Syriza Government in Greece – which has, in effect, capitulated to EU diktat within a month of getting elected – is a warning to us all. Breaking the power of the global corporations and the militarised states is going to involve a massive, protracted, complex historical struggle. Marienna: In the long-term, the Green Party will be as good as its membership is active and part of the wider movement – because that’s how real change happens, and this is about so much more than getting the right people in government. That said, I think this explosion of support we’ve seen for the Green Party in Britain is really exciting. It reflects a lot of things, of course, not least war-weariness, concern for the environment and the impact of and resistance to austerity cuts – the Greens being the only major party in this country willing to take a stand on anything that matters anymore. But it’s also about how the complete degradation of the Labour Party into an unrecognisable, neoliberal husk of its former self has opened a gaping hole in our political culture as far as parliamentary politics goes. People have known for a long time that the system is corrupt. They were content to vote for their ‘lesser evil’ because they couldn’t see any alternative. That’s what really excites me about the Greens: they represent a nationally visible, tangible alternative people are willing to go out and vote for. Join up to, even. Our job is to help people understand that the alternative is possible, but voting for it’s not enough: we’ll have to protest, occupy, strike and disobey to wrestle our economy back from the rich. Dan: What about the existing far left? We all have links to that background, which is in a bit of a mess right now. What, if anything, can these organisations and traditions contribute? Marienna: Neil said to me recently that after 40 years as an active revolutionary he’d finally come to the conclusion that “there is no formula for social change.” It’s true. Social change is as much an art as it is a science. We’re all learning as we go, but a huge part of that art is being able to treat people the way we think a better world might treat them: with respect. Without that we can’t have healthy political alliances or personal relationships. Nor can we grow, unless we create a culture, a community that people want to be part of. Neil: I do speak very much as what I call a ‘refugee’ from the Old Left, which I was part of for 40 years. Organisationally the Old Left cannot really contribute anything. I am now convinced that you cannot graft new growth onto dead wood. The young activists think the Old Left sects and splinters are a joke. They are right. Individually we have to make an organisational break and set about building completely new organisations from the bottom up – organisations that are broad, inclusive, participatory, democratic, and dominated by young people. Small groups of non-sectarian revolutionaries should dissolve themselves into mass organisations of the kind I have been describing. Anything else simply prolongs the agony of slow and inevitable organisational death. There is no historical example of a small group setting itself up, proclaiming a ‘correct line’, and slowly becoming a mass party through something called ‘the primitive accumulation of cadre’. The way revolutionary parties emerge is through the crystallisation of revolutionary ideas and cadre inside mass organisations in the context of mass struggle. Marienna: I think that those organisations and traditions can contribute to the extent that they can accept the need to create a culture people want to be part of, and listen to young people. When you can’t accept it, then you get the territorialism, the sectarianism, the antagonistic identity politics, the ‘I’m a better radical than you’. I think most people understand this is our greatest internal obstacle – but fewer seem to grasp that this calls for a deep cultural shift. One example: I think a lot of groups are losing the argument with radical young people about political organisation and formal membership. This cultural shift against formal organisation happened for a reason, there is a debate to be had and a new conclusion to be reached that reconciles the best of our tradition with the possibility of the present. Basically, we need to start taking each other seriously if we want the world to take us seriously as a united force. I really hope that’s something that the existing far left can manage because there’s so much cumulative collective wisdom there and we can’t get it all from books! It’s also a culture I’d like to see This Changes Everything help cultivate – and people are telling me that what we’ve managed so far is a big part of why they’re making 28 March their first big political event. Dan: Neil, you’ve spoken before about the importance of learning from history. Which historical experiences do you both think we should be focusing on today? Neil: Well, there are so many, but here are two ideas: First, the Bolshevik experience has been the subject of the most grotesque caricature in the canon of post-war Trotskyism. Lenin was a democrat, and whenever possible – in 1905 and 1917 – he was in favour of mass participatory democracy in the party. Historical necessity has been turned into a theoretical dogma and used to justify an abusive and dysfunctional form of top-down internal party organisation. Indeed, modern forms of ‘democratic centralism’ have often been far worse than anything the Bolsheviks did. Second, the Paris Commune. They did not have soviets or workers councils; they had a democracy based on geographical districts. Now, I strongly suspect, given the fragmentation of workplaces, communities, working lives, and so on, the growth of casualisation and high labour-turnover, and the relative weakening of the unions, that geographically-based mass democratic organs are more likely in a future revolution than industrially-based councils. We do not have mass strikes spilling onto the streets and becoming mass demonstrations or pickets. We have mass demonstrations which sometimes trigger what might be called ‘turnout’ strikes, like in Egypt during the Arab Spring revolution. The street, not the workplace, leads. So the Paris Commune may turn out to be a better guide to what a future revolutionary movement might look like than 1917 Petrograd. Marienna: I think history is the most important lens to look through if you want to see clearly the how and why of the system we live in and how people behave within it. That said we are where we are, not where we were. Reform, revolution, social transformation – these are vastly complex processes we’re talking about, contingent on a picture we can never see completely. So I’m cautious about fetishising singular historical moments at the expense of learning from our global present and using our imaginations about the future. We need to talk more honestly about our shared history, be inspired by it and keep the best of it close. But we also need a new generation to take the lead by taking action and developing its own ideas about how we can change our world. And that’s another point for This Changes Everything’s to do list after 28 March! Reading This Changes Everything, I started asking a lot of new questions. A number of us in the British student movement campaigning against war and austerity were increasingly perturbed by the lack of concern about climate change among some of our peers, even though we knew that extreme weather is displacing more people than war now, and that the destruction of the planet’s life-support systems would make it impossible for progressive politics to fulfill its promises. I was frustrated when activists cautioned: “The welfare of pandas and ice caps is a middle class concern. You just can’t mobilize around it.” Particularly maddening was a rather bleak sense that they had a point. While the British Left may have been on the back foot since Thatcher, things had reached new lows for us twenty-somethings; we’d grown up with the relentless, televised War on Terror, and a Great Recession that should have discredited free-market fundamentalism but instead was being used as a battering ram to destroy what was left of the British welfare state. We had been reduced to defending the last of the gains made by our grandparents, things once taken for granted: universal rights “from the cradle to the grave.” Climate change seemed like one too many fronts to be fighting on. My friend Francesca Martinez, the comedian and campaigner, often complained about this attitude: that there wasn’t any room in the Left’s agenda and anyway, climate change was too depressing and distant. For her, the problem was the lack of positive vision in a movement defined by what it opposed; speaking across the country, she encountered an appetite for an inspiring, justice-based alternative. And when a friend of mine (now my partner) showed me Naomi’s 2013 speech at the founding convention of the Canadian union UNIFOR, on why organized labor should join the climate fight, the implications of her message finally sank in: that this crisis was a historic opportunity, a planetary demand for system change. Around the same time, some friends and I were launching a new project called Brick Lane Debates, to experiment with new ways to get people engaged with politics. Frustrated with both the passive lectures of the “Old Left” and horizontal forums too tied down in procedure to get much done, we wanted to synthesize good organization with meaningful participation. And we didn’t just want debate, we wanted music, comedy, culture; to build a vibrant, inclusive community animated by the ideas we thought could change the world. Our first Brick Lane Debate was about climate change, and brought together a new constellation of campaigners with a growing group compelled to action by Naomi’s analysis. We had all joined the People’s Climate March, which provided beautiful, bold confirmation that you can mobilise around the climate. We were particularly inspired by the leading role played by organized labour in New York—but with honourable exceptions, it was largely absent in London. Unless we could join the dots between war, austerity, and climate catastrophe and quit leaving the environment to the environmentalists, we concluded, we would be giving up the single most powerful case for democratic system change we will ever see. That’s the message that is striking a chord with growing numbers of young people. And that’s how This Changes Everything UK was born. March 28th will bring hundreds of people together with leading campaigners and climate scientists for a participatory gathering. At workshops taking inspiration from the Brick Lane Debates model, we’ll talk about the connections between the climate and economic crises, share visions for an alternative future, and discuss how to grow the social movements we need to get us there. From anti-poverty and environmental organizations like War on Want, Friends of the Earth, and the Young Greens, to radical campaigns like Fuel Poverty Action network, Occupy, and the newly launched Join The Dots, people are ready to stand up for all these ideas, together. And the time is right, it seems to us, for such a symphony of radical voices to be heard. In the UK, the historic scale of the People’s Climate March was just the beginning. Vigorous grassroots campaigns against fracking have been erupting in sleepy rural communities. And the recent surge in Green Party membership here reflects not only concern for the climate, but also deep disillusionment with the narratives being regurgitated by our political establishment and their megaphones in the mainstream media. Public trust in government, the press, and the police has never been lower, while participation in political protest is at an all-time high. Meanwhile, we see progressive coalitions transforming the political landscape in Greece and Spain. Old assumptions about what is impossible or inevitable, or what people have the capacity to care about, have no place in the new movements that are emerging. If there was ever a moment to change everything, it’s now. Like us on Facebook and follow @TCEuk on Twitter. We’re still organizing the format and structure of the March 28th gathering, so if you’d like to get involved or think your organization could help lead one of our workshops, drop us an email at thischangeseverything2015@gmail.com.